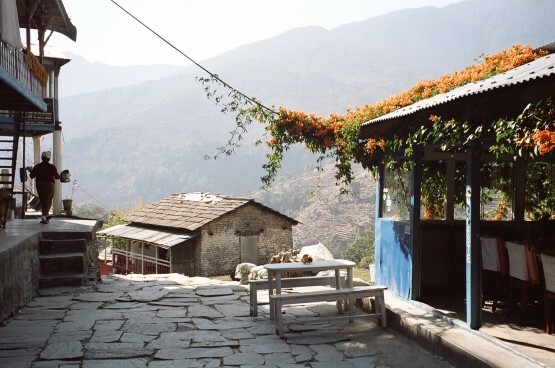 Erin George recounts her experience of her first few days in Nepal- thanks Erin! Since arriving, we’ve mostly been relaxing and doing orientation type things. Today we picked fabrics and were sized for our Kurtas, which is the proper attire for teaching in school. We also had our first Nepali class which was awesome. And we’ve eaten a ton of good food! All the people on the trip are awesome! Love the group, which of course is a good thing! The trek through the Himalayas was absolutely amazing. It is without doubt one of the most incredible experiences I’ve had. The views were astounding and bonding with the group was wonderful. The peak was absolutely breathtaking! There was a glacier to one side and an enormous range of mountains everywhere else. As far as you looked all you could see was blue sky and mountains. As far as the actual mountain goes, there were two major types of terrain. The first type which was mostly the first two days (and the last two coming down) was very much up and down and in a jungle-like setting. We were by the river surrounded by greenery; shrubs, trees etc. The other terrain was much more open and plain-like despite being in the mountains. There were no trees and all you could see in any direction were long stretches of mountains. It was amazing! I think the best word for it is majestic. In terms of actual wildlife, we saw lots of animals. Unfortunately most were just cows and yaks which become far less exciting after seeing the first few. We did see lots of monkeys though and we even saw a rare red panda which was incredibly lucky. Plant-wise there were lots of interesting trees that I did not recognize but Yam, our guide, didn’t take much time to mention them. The weather was incredible! We couldn’t have asked for bluer skies. Everyday was sunny with the most pure blue sky I have ever seen. The temperature was actually nice despite being mid-January. During the walking we were usually quite warm, in fact stripping layers to compensate for the warmth. However, night was a different story. The nights were frigid. Literally. At the base of Kanjayree Peak, where we stayed two nights, the night temperature must have dropped below -10 degrees Fahrenheit. Our waterbottles would freeze overnight. All battery operated electronics (which means all of them because there’s limited electricity) stopped working because the batteries couldn’t handle the cold. I slept with my camera in my sleeping bag to preserve the battery life for the next day! It worked surprisingly well. Thank heavens I had such a warm sleeping bag on the trek! And that novel of a description was my trek! I had an amazing, wonderful, brilliant time! All the challenges and quirks, whether the actual hiking or the toilet situation, just made it that much better. We definitely bonded as a group through this mutual experience and I can’t think of a better way to do it. I think it is a bit too soon to start planning my next trek, but it is definitely and experience I would recommend. You really learn about yourself, your abilities and your lifestyle by stepping our of your comfort zone and doing something like this. I am hoping to enjoy teaching as much as I enjoyed trekking as that is now where my anxiety lies. With any luck, it will be just as wonderful. Well, for better or for worse you will be hearing about it soon! Find out about teaching in Nepal on our gap year in Nepal page.